Stoicism is apparently popular again — at least, that’s how it appears, given the spate of recent popular books, articles and events on the topic. There’s Julie Beck’s essay from The Atlantic on the benefits of thinking about death like a Stoic, Oliver Burkeman’s book on the “negative path” to happiness that includes a chapter entitled “What Would Seneca Do?”, and, perhaps most notably, an article that appeared in the New York Times, which created a sensation and which the author, Massimo Pigliucci, is now developing into a book. There are also Stoic meet-ups occurring in cities all over the world; the New Stoa, an online community of modern Stoics who offer courses and publish a magazine; a blog called Stoicism Today; and “Stoic Week”, a yearly social event/science experiment, in which participants live according to Stoic principles and submit data about their experiences to be analyzed for changes in quality of life. The level of enthusiasm this philosophical revival has produced for an ancient belief system is surprising but also inspiring. These manifestos and popular expressions don’t just celebrate an academic engagement with Stoicism; they advocate using it as a practical tool in our everyday lives. They are a far cry from the criticisms of Stoicism as a cold, harsh school of thought, where suppression of emotion and a Vulcan-style detachment from the world is paramount. And yet, all this positive press made me wonder: what exactly is Stoicism’s appeal for us moderns? What’s behind the desire to rehabilitate a way of life once championed by hard-bodied soldiers and toga-clad politicians? Why is being a Stoic so cool right now? Anyone even glancingly aware of the world of self-help cannot have failed to notice that the practice of mindfulness, or “living in the moment while calmly acknowledging and accepting one’s feelings, thoughts, and bodily sensations”, is all the rage these days. Celebrities, tech gurus, and sports stars are publicly swearing by “getting centered”, “being fully present” and “unplugging” through practices such as meditation, yoga, or even visualizing a dot for sixty seconds. Most practitioners of mindfulness understand its origins to lie in the Eastern spiritual traditions of Buddhism and Hinduism; however, the Western world also had a longstanding tradition of mindfulness. That tradition is Stoicism. Ancient Stoics were all about living in the moment, a goal achieved by cultivating self-control and self-awareness through meditative practices, though not necessarily of the om-chanting variety. They “thought about thinking” by considering their emotions from a rational perspective, reflecting on the ethics of their decisions, and constantly reminding themselves that while they had no power over what happened in life, they did have power over their responses to it. The slave-turned-philosopher Epictetus summed up this idea in his Stoic handbook, the Enchiridion: “Men are disturbed not by things, but by the views they take of them” (5). His advice? “Don’t expect that events to turn out the way you want, but wish them to happen as they do happen, and you will get on well” (8). Today’s mantras of mindfulness sound strikingly similar to those of Epictetus, and many activities that Stoics undertook to achieve equanimity are similar too. Take, for example, the premeditatio malorum, a methodical visualization of the worst-case-scenario for any situation. Here’s how Seneca describes it: “We need to reflect upon every possibility and to fortify ourselves against whatever hardships may come about. Run through (meditare) them in your mind: exile, torture, war, shipwreck” (91.7–8). He goes on to explain how, if we do this regularly, we can minimize our fear of life’s misfortunes and prepare to face them. The extreme version of this practice is, of course, imagining our own or a loved one’s death. So Marcus Aurelius exhorts us to “Think of yourself as dead. You have lived your life. Now take what’s left and live it properly” (7.56). Part of the premeditatio’s charm for us is that it exposes the limitations of purely positive thinking, which was one of the last big self-help trends (remember the book The Secret? ), by turning it on its head. For the intelligent and sophisticated among us, it’s not enough to hope and wish for the best. To find success and contentment, we instead must grapple with all possible outcomes, especially the bad ones. (This tendency likely explains the growing popularity, especially in the business world, of a variation on the premeditatio — the project premortem.) The practice of premeditatiooffers us an efficient way to generate not only a deep state of mindfulness, but a keen sense of gratitude as well. To enhance their sense of gratitude, ancient Stoics also utilized practical techniques, such as voluntary discomfort (cold showers, foregoing sweets, et cetera). Or they would deliberately engage with what they called “externals” or “indifferents”, such as money, fame or even good health (which are desirable but not necessary), only to remind themselves that all they really needed to have a good life was virtue. These exercises in reverse psychology are more extreme than journaling or volunteering, but the same spirit and the same goal — achieving eudaimonia, or happiness with one’s lot in life — informs both the ancient and modern practices of gratitude. For both Stoic philosophers and modern mindfulness advocates, it’s not enough to endure life’s ups and downs; we should appreciate and enjoy all that it brings. Seneca encapsulates the sentiment well in his essay On the Happy Life: “The happy man is content with his present lot, no matter what it is, and is reconciled to his circumstances; the happy man…allows reason to fix the value of every condition of existence” (7.6). Ancient Stoicism may seem far removed from us in time and space. But Seneca’s words, which echo those of modern-day gurus like Deepak Chopra and Eckhart Tolle, clearly demonstrate that when it comes to helping ourselves, Stoicism’s aims and message may be more resonant than ever. Since the early 2000s, a number of outspoken critics of traditional religion have received a great deal of media attention. The rapid rise of these “New Atheists” reflects a broader trend of growing disenchantment with organized religion. Many people are sympathetic to New Atheist critiques of religion as dogmatic, outmoded, politicized, and violent; they’re also compelled by the efforts of New Atheists to use scientific inquiry as a means of debunking religious beliefs. Much ink has been spilled lately, for example, trying to disprove God’s existence through scientific methods and logical arguments (see the work of Richard Dawkins and Victor Stenger). These efforts have inspired people at all points on the skepticism spectrum to search out systems of belief that lack the ideological baggage of the world’s dominant religions. And in their search for a new life stance, one place they quickly end up is secular humanism, which, according to the International Humanist and Ethical Union, “stands for the building of a more humane society through an ethics based on human and other natural values in a spirit of reason and free inquiry through human capabilities.” Those who dig deeper into the history of humanism soon find themselves standing on Stoicism’s stoop, since much of what humanism champions — rationality, freedom, virtue, naturalism — serves as the foundational principles of ancient Stoic philosophy as well. To people who are leaving behind organized religion, Stoicism’s emphasis on reason as the law (or logos) that shapes and guides the universe is refreshingly simple. (It may also explain why you’re constantly hearing the phrase “Everything happens for a reason” uttered by everyone from your mom to Barack Obama.) Ancient Stoics believed that, as part and parcel of the universe, we humans have our share of reason within as well (see Marcus Aurelius, Medit. 7.9; Musonius Rufus, Frag. 38). And by using our reason to guide us, we can understand the nature of reality and perceive the truth. Amazingly, this is all that’s required to be a good person and live an ethically correct life. So Seneca says, “Virtue is nothing else than right reason” (Ep. 66.32). Right reason is the path to contentment: “If you accomplish the task before you, following right reason with diligence, energy and patience…if you can hold to this, without fear or expectation, and find fulfillment in what you’re doing now… you will live a happy life” (Marcus Aurelius, Medit. 3.12). That being reasonable is all that’s required for a good and happy life is a very freeing concept for those who have attempted to live according to the arcane rules and odd prohibitions of Judaism, Christianity, or Islam — and for those who just aren’t sure what to believe. You don’t have to have all the answers; you just have to think rationally and do what’s right. That’s what Epictetus recommends: “Isn’t it enough to know the nature of good and evil, the limits of desire and aversion…and to use these as rules to administer the affairs of life, without troubling ourselves about things above us? For these things are perhaps incomprehensible to the human mind” (Frag. 7.175). The Stoics’ acceptance of both our capacity to live rightly and our inability to understand all also underlies their theology, including their conception of God. As a philosophy that evolved over time, there is no fixed dogma or text that defines “Stoic belief” on this topic. (Of course, many Stoic beliefs, including that of a unitary god with multiple aspects, were absorbed into Christian doctrine. This makes them strangely familiar to us and may also, ironically, make them all the more appealing too.) However, for most ancient Stoics, God, or more appropriately, Zeus, certainly did exist. He was a singular entity, equivalent with Reason, which encompasses and directs all of Nature or the Universe for a purpose. Some Stoics were devout worshippers of this god: see, for example, Cleanthes’ Hymn to Zeus or Epictetus’ famous declaration, “If I were a nightingale I should sing as a nightingale, if a swan, as a swan: but as I am a rational creature I must sing to God” (Discourses, 1.16). Others were less certain about the nature of the divine. The debate continues to this dayamong modern philosophers, but almost all Stoics seem to agree that in the end what you think you know about God doesn’t really matter — you still can and should pursue the good and live virtuously. As Marcus Aurelius puts it, “Things are either isolated units [atoms], or they form one inseparable whole. If that whole be God, then all is well; but if aimless chance, at least you need not be aimless also” (9.28). Stoicism offers its modern-day devotees a sort of New Atheism “lite”, seemingly untainted by the clashes that define contemporary religious (or anti-religious) thought. It doesn’t demand adherence to an all-or-nothing view of God, or project a sense of self-righteous certainty about matters that are beyond our control (or understanding), even as it champions goodness and reason. This calm yet confident focus on being our best selves, no matter who or what rules the cosmos, may be what’s drawing so many people toward the Stoic way of life. Stoicism is a philosophy that, in the words of Kare Anderson, was “built for hard times.” It emerged in the early 3rd century BCE in Athens, after the premature death of Alexander the Great left the eastern Mediterranean in disarray. The political and social upheaval of the times made many people anxious about their place in the world: migration became necessary for survival and the independent power of the polis to define its inhabitants’ identity went largely by the wayside. In its place came rule by inefficient and often corrupt kingdoms. Rapid and arbitrary change became the new normal during this era. This chaotic period in history shares quite a lot with the current one: think legislative intransigence, the Great Recession, climate change, income inequality, the war on terror, and the widespread displacement of peoples all over the globe. Living in such a volatile world has compelled individuals to seek out a path to inner tranquility, just as they did in the early Hellenistic period. Now as then, Stoicism offers them a promising route. In unpredictable times, it makes sense to rely on ourselves and find strength in our individual autonomy. Deciding to act with reason and virtue is something the turmoil of the outside world cannot change. As Seneca points out, “If you really want to escape the things that harass you, what you need is not to be in a different place but to be a different person” (Ep. 104.8). And yet, Stoicism doesn’t advocate a retreat into a self-absorbed world of one’s own — quite the opposite. Ancient Stoics believed that a major component of virtue was serving other human beings and recognizing our common humanity. 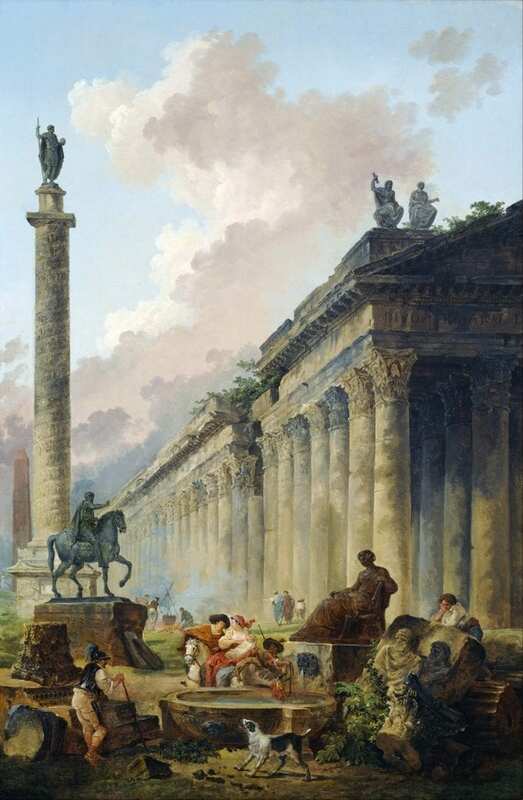 In fact, it was the Stoics who first made popular the concept of cosmopolitanism, and encouraged people to see themselves as “world citizens”, not defined by location, class, or religion: “Never in reply to the question, to what country you belong, say that you are an Athenian or a Corinthian, but that you are a citizen of the world” (Epictetus, Discourses1.9). By concentrating on the similarities between us, we can succeed not only at living in accordance with nature, but also at creating a new, expansive sense of community that transcends local differences. Ancient Stoics also used the concept of oikeiosis to understand ethical duties and relationships with others in communal terms. Oikeiosis derives from the Greek word for “home” or “family” and essentially means “having a natural attachment to what is familiar” or “viewing something as belonging to oneself.” Stoicism encourages us to extend our sense of affinity and concern outward, from our selves, to our family, to our fellow citizens, to all people — to zoom out, as it were, and to collapse the distinctions between yourself and others. It also gives perspective on just how insignificant you are in the grand scheme of things. 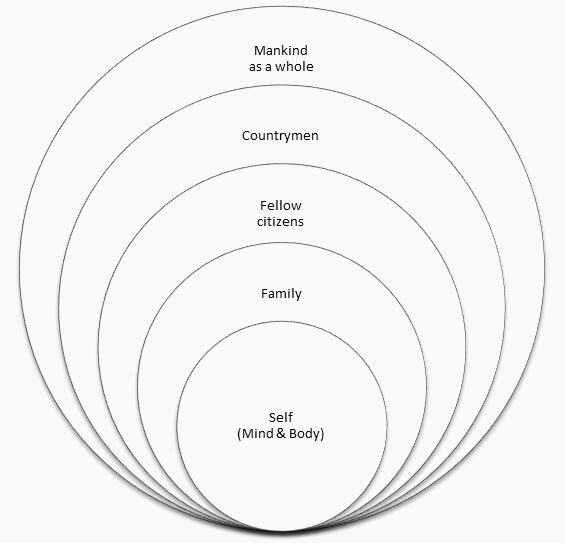 The philosopher Hierocles created a way of visualizing this idea of duty radiating outward in the form of concentric circles, while Marcus Aurelius simplifies the concept: “Whatever happens to you is for the good of the world. That would be enough right there. But if you look closely you’ll generally notice something else too: whatever happens to a single person is for the good of others” (6.45). Seeing the world in this light — as one big family or commonwealth where whatever happens to the most distant person is also important to our own lives — fosters our empathy toward each other. Perhaps more importantly, it promotes a sense of justice that transcends our own self-interest. This justice ideally pertains to all members of society and aims to set us in harmony with one another. It compels Seneca to reminds his friend Lucilius that slaves are really “our fellow-slaves, if one reflects that Fortune has as much power over us as over them” (Ep. 47.1). For the Stoics, recognizing our equality as humans brings social harmony — a necessity if we want to live rightly and find true fulfillment. The value for our globalized society of thinking and acting in a manner that emphasizes our similarities and increases our capacity for compassion and justice can hardly be overstated. Solving the problem of climate change, for example, will undoubtedly require us to draw upon and develop these qualities further than ever before. And yet, it seems to many that as a society we are only growing more fractured and detached from one another, focusing on our divergent political views, or our racial and religious differences, or our distinct lifestyle choices (all this notwithstanding our ubiquitous connectedness via the internet). “Doing as the Stoics did” provides moderns with a means to combat this trend; it also reflects a desire to restore simplicity and fairness to our current code of human ethics. And while a nostalgic fantasy about the unerring “wisdom of the ancients” may underlie this desire, it may be that turning back to this old school of thought is actually a sensible step in our efforts to move forward: “If you can see the road, follow it. Cheerfully, without turning back. If not, hold up and get the best advice you can. If anything gets in the way, keep moving forward, making good use of what you have on hand, and sticking to what seems right” (Marcus Aurelius, Medit. 10.12). If this approach worked for past practitioners of Stoicism, why can’t it work for us? This post originally appeared on Eidolon.